The original induction coil was invented in 1836 by Nicholas Callan (1799-1864), a priest and the professor of natural philosophy at St. Patrick's College at Maynooth, County Kildare, Ireland. The basis for the coil was his large electromagnet with primary and secondary windings on the extremities of the U-shaped iron core. The primary circuit was interrupted (to get the required alternating current) by the mechanical Repeater that Callan designed. Callan's Great Induction Coil (left below) was left unfinished at Callan's death. The three secondary coils contain a total of 150,000 feet of fine iron wire. The primary coil is made of copper tape, wound around a core of iron wires. At the right below is the (incomplete) mechanism of interrupting the primary current. This apparatus, along with a similar one made by Callan which has only one secondary coil, is on display at the St. Patrick's College museum. The museum at St. Patrick's College contains parts of other early induction coils by Nicholas Callan. At the right are two long primary coils, and four toroidal secondary coils. The latter were insulated with a mixture of melted rosin and beeswax. Callan found that he could insulate 8000 ft of iron wire, 0.03 in. in diameter, per hour by passing it through this mixture and allowing it to harden on the wire, all in a continuous process. Independent of Callan, the American electrical inventor Charles Grafton Page (1812-1868) developed an induction coil in 1836. His 1838 Compound Magnet and Electrotome, manufactured by Daniel Davis, Jr. (1813-1887) of Boston has a feedback mechanism to make and break the primary circuit. 2 cm thick. This sort of coil is often called a Ruhmkorff coil, after the Parisan apparatus manufacturer Heinrich Daniel Ruhmkorff (1803-1877). Although he did not invent the induction coil, his name is often associated with it (particularly in Europe) because he successfully put together all of the elements of the coil, including the use of the condenser connected across the primary to moderate the back EMF of the collapsing magnetic field of the secondary. The five small Induction Coils below are typical of instruments bought in the last third of the nineteenth century and the first part of the twentieth century by colleges and universities for demonstration use. A larger model giving a 150 mm spark was $91.00. This coil was given by Richard Zitto to Thomas Greenslade, who did a certain amount of restoration work. On the bottom of the device is written the date 5/11/27, in good agreement with the catalogue date. In 1857 Edward. S. Ritchie (1814-1895), the Boston maker of "School Apparatus" for courses in Natural Philosophy, announced "Ritchie's Improved Induction Coil". In his 1881 catalogue he noted that he had devised "the mode of winding the secondary helix in strata, in planes perpendicular to the axis, requiring but slight insulation, and rendering the increase in the tension [voltage], and length of the spark to two or three feet, practicable." This was an expensive piece of apparatus: in the 1869 Ritchie catalogue a smaller machine, capable of producing a six inch spark, cost $337. The machine at the right is in the Greenslade Collection and bears a patent date from April 1868. The closeup at the right of the interrupter mechanism of the Ritchie coil shows the rotating toothed wheel that is used to make and break the contact the primary circuit. The picture was taken by my former Kenyon student, Daniel Hayden, of a piece of apparatus at the Williston Northampton School in Easthampton, Massachusetts, from which he graduated. This is a really big coil! The inner coil is 87 cm long and has a resistance of about three ohms, and runs on 10 to 20 V. The outer coil's resistance is 35,000 ohms and puts out 100,000 V. The base is made of cherry. The instrument was made by the firm of Elmer G.Willyoung & Co. of Philadelphia, and is in the Garland Collection of Classical Physics Apparatus at Vanderbilt University. Its cost approached $200. Manufacturers often offered induction coils in a series of sizes. Here is a smaller version of the coil above, also made by Willyoung of Philadelphia. Here, the inner coil has a length of about 50 cm. There are plans to replace the black plastic tape around the outer coil with a more appropriate material. This induction coil is in the collection of the University of Vermont. In the last few years of the 19th century, the smallest Willyoung coils, able to produced a 2 inch spark, cost $40, while those able to produce a 12 inch spark cost $200. When Willyoung went out of business in 1899 its lines were taken over by Morris P. Leeds & Co. The 1916 catalogue of the L.E. Knott Apparatus Company of Boston has a complete line of induction coils. The coil at the left below is a "New Line" induction coil designed to give a two inch spark. This was recommended for the production of X rays and for use in spark radio transmitters, although this is close to the end of the era for both of these uses. It sold for $37.50; the model with a guaranteed discharge of eighteen inches was $240. The apparatus on the right below is a reversion to the early form of the induction coil, with a primary coil, a secondary coil, and a separate magnetically-actuated make and break mechanism. The primary coil can be pulled out and the core, made of a bundle of wires, can be removed. This cost $10.50. These two examples are in the collection of Richard J. Zitto of Columbiana, Ohio. 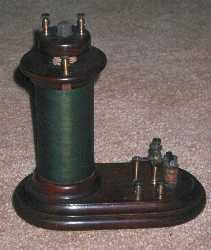 This demonstration induction coil, in the Greenslade Collection, is a relatively rare piece of early twentieth century electrical apparatus by Gaertner. The inductive coupling between the primary and secondary, and hence the length of the spark, can be varied by moving the outer coil sideways. The make and break contact in the primary circuit is on the left-hand side of the apparatus. This is the smallest induction coil I have ever seen. The coil is only 9 cm in length. In the 1929 Central Scientific Company catalogue this is probably the $8.00 model that would give a spark 6 mm len length. The coil is in the Greenslade Collection, and came to me from Carroll College in Wisconsin. 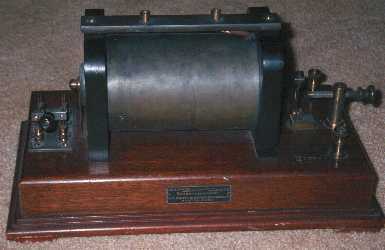 This small induction coil at Westminster College in western Pennsylvania is unmarked, and has an overall length of 23 cm. In the twentieth century induction coils took on a new form when they were used as part of the ignition system of the Model-T Ford. Consequently, this form was almost always referred to as a Ford Coil. This example, at Kenyon College, is made by the Crescent Machine Co. of Detroit, Michigan. About 1960, Ford coils were part of the standard apparatus for the Physical Science Study Committee physics course, and were used to excite discharge tubes.